By now it was time for the archery to be open and we were very excited. 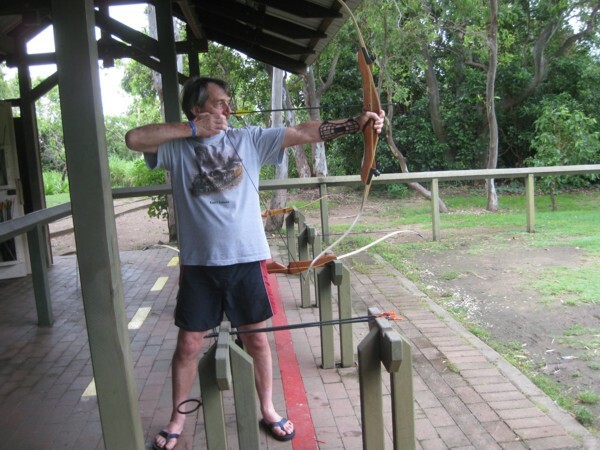 We’d done quite a bit of archery, admittedly with very cheap equipment, about 25 years ago and thoroughly enjoyed the sport, so we found ourselves a little disappointed when a whole heap of people all turned up. The lovely G.O. who was running this activity was rather too methodical for our tastes (read, we wanted him to hurry up LOL), but eventually all the bows, arrows and arm guards were given out, along with some basic instructions and we were allowed to shoot. After shooting our 4 arrows each, I think David had one hit the target and I had none, we then needed to hand over the equipment to the other people awaiting a turn. Fortunately, in our eyes, these people all seemed happy with just one turn and then left so we grabbed bows and arrows once more and had a really decent shot – in both senses of the word. As more and more people left we were able to use more arrows each before having to go and collect them and had plenty of chance to get our eye in once more. After a while I was doing better than David and seemed very suited to the sport. Collecting the arrows meant more trudging through wet grass and into the occasional puddle as well but we were having a ball and didn’t care. Eventually it was time to go back to our room and shower where we discovered that the mud on our feet had actually stained our skin and was all around our toenails, impossible to remove without a nail brush which we did not have with us. Oh well. We got ready for dinner which had a ‘colourful theme’ for clothing and David wore one of his Hawaiian shirts. It was common practice for the G.O.s to come and sit with guests at meal times and tonight we were honoured by 2 coming and asking if they may sit with us. We loved this couple instantly; both were fairly new staff members, Glenn from the UK and Monica from New Zealand. Glenn seemed to be a jack of all trades, helping out backstage for the shows and popping up all over the place doing things. Monica was a circus specialist, but more about that later. David left the table to go and get some food and I mentioned that it was his birthday the next day and Monica and Glenn suggested I mention this to the kitchen staff as they would make him a cake. Getting away from David to do that would be another matter as we’re always together but when we left dinner and found our seats in the theatre ready for the show I just said to David that I’d be straight back. Being the innocent (OK, gullible) creature that he is, he thought nothing of it and I snuck back into the dining room and gave his details to one of the very helpful waitresses. The show tonight was called ‘Around the World’ and Steve told us that the G.O.s came from 22 different nations so they had a lot of culture to draw from. It was a really great show and I was very impressed with the simplicity but effectiveness of the costumes. The star of the show to us was an Asian girl who was centre front for the cancan. She never appeared to tire and her feet were well above her head and her legs straight for the whole thing. The whole cast were brilliant and we began to regret having missed the Michael Jackson show the night before if it was of this calibre. Unfortunately, as for all of the shows, the light wasn’t bright enough to be able to take decent photos so I can’t share these with you. After the show we had another little drinky poo each – actually, David had had a couple of glasses of red at dinner. I don’t normally drink alcohol but on holidays I really let my hair down and during the evening had a couple of cocktails and a bundy as well. Once ready for bed the weather was fine for our walk back to our room. It was David’s birthday and we awoke to fairly strong winds and rain. He opened up his half a dozen cards and was happy with those. I was going to treat him to a helicopter ride to a private beach with a gourmet picnic basket for his present but visibility was really poor because of the weather so we never did get to book that trip. Such a shame, but really not worth going in a helicopter if you can’t enjoy the view. I decided not to do the Tribal class today because yesterdays had been so busy and squashed but was really peeved with myself as we passed by the venue on the way to breakfast to see only half a dozen people taking part. Buggerit, I’d have been there like a shot if I’d known that! At breakfast and lunch the food felt as if it was getting decidedly boring for some reason but from dinner on through the rest of the holiday I really enjoyed it so perhaps it was just me. We decided that we could not stay indoors all day with the rain but would take one of the walks to a beach and I put contact lenses in as I hate rain on my glasses, and off we went. Oh, I should add that we had to brave putting our feet into our sport shoes which were not only still wet through but absolutely STANK as well. Once they were on it wasn’t so bad so once more it was up all the stairs, right at the grassy airport strip just before the archery, and sploosh into our first puddle that was the whole way across the pathway. This was followed by a mud bath of the same proportions and we just accepted it and walked through the middle. Believe it or not I did this more readily than David! The grassy path would have been very easy going in fine weather but after sliding a few times it wasn’t long before I landed on my rear end in an inch or so of water. And again not much further along. A third time I slipped but just managed to save myself, mere centimetres from the ground. I was making the mistake of walking in the middle of the running water with the conviction that rivers have rocky bases making for firm footing. However the bottom of these streams was grass! David slid a few times too but he’s faster moving than I am and he saved himself each time. We sloped down below the grasslands and entered a part with trees around us. Sometimes there were rock steps but mostly still the wet grass, zig-zagging ever downwards and eventually came through the trees to a rocky beach with some small trees in it. There was a small stream coming to join the ocean and we’d read something about a stream in the brochure and were not really sure if we’d arrived at our destination or not. There appeared to be a pathway between the trees beyond the stream but we weren’t sure. The brochure had been a copy of a copy of a copy and the writing very hard to read. We looked around at the scenery and decided we probably had reached the end so went back again. I slipped once and landed on my knees as we climbed and David had his worst slide as well. But it was fun not to feel that the weather was dampening our holiday anyway. We probably only covered about 3 kms in all and it took us about 1½ hours. We had some lunch and then looked around the little shop. There was lots of clothing, priced as you’d expect for a souvenir place and we didn’t buy anything. The staff were lovely and friendly though. After this we climbed up to the conference room, which made a climb of over 200 steps from the lunch room, to listen to a nutrition talk. The speaker was falling all over herself trying to go quickly but only succeeded in giving a muddled talk which also involved meeting herself coming back during her slideshow. I wasn’t terribly impressed, nutrition being my topic of study for the past 3 years, but I know I have some very alternate ideas so I didn’t ever expect to see eye to eye with her. At the end I asked her advice on how she would cope, meal-wise, with the strange hours that David and I keep as I haven’t been able to come up with a decent solution myself. I was horrified to be told that she thought a sandwich to be suitable as your main meal of the day, 6 days a week! What about vegetables??? I won’t dwell on this topic or I shall get wound up and you’ll never hear the end of it ROFL Suffice to say that we both felt we’d wasted an hour of our lives listening to her. 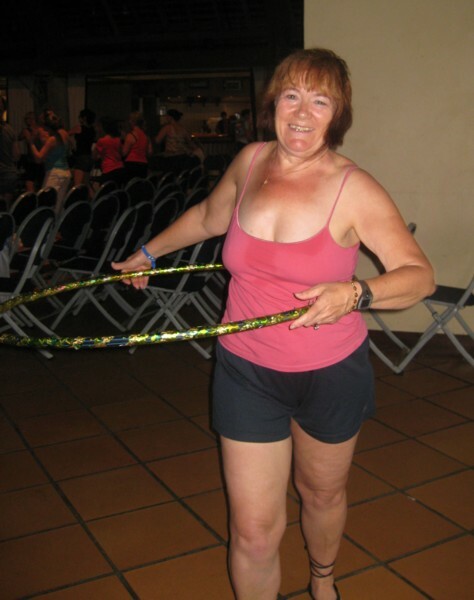 We went for a drink as the bar was open and I saw hula hoop lessons going on in the theatre so eagerly went to join in. I have always wanted to be able to do this! The teacher was Monica and she gave me some great advice and it immediately paid off, I was so thrilled. She was also supervising quite a few children with juggling balls and that cotton reel shaped thing that you spin on a string between 2 sticks. It was great fun and I was sad when the lesson ended. After a shower it was time for dinner which tonight was a black theme for dress. The meal was Indonesian and absolutely delicious!!! There were some wonderful flavoured fish dishes so for once I had a lot of things I could choose from. 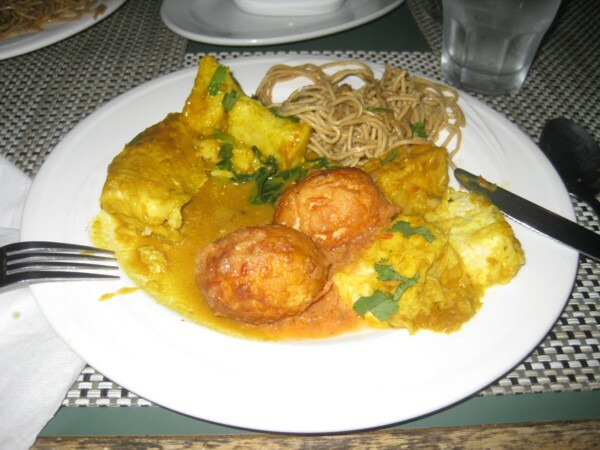 There were also boiled eggs with a coating and noodles which I have a soft spot for. Totally yummo!!! 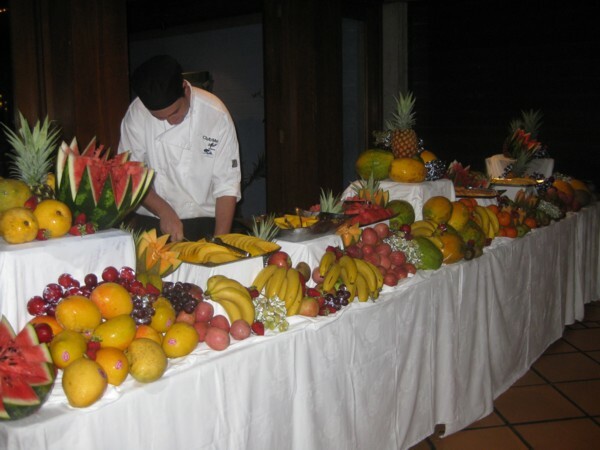 Dessert was a fruit table such as I’ve never seen before, it was astounding! I’d been told to let a staff member know where we were sitting so that they could deliver David’s birthday cake so I pretended to forget the butter and went looking for some – it was never in the same place twice so this was a great excuse anyway. David wasn’t to know I’d found it in the first place I’d looked for once. As we ate our first course I am fairly certain that one girl kept checking to see if we were ready for dessert but David didn’t notice and why would he? After our plates had been collected, suddenly someone started to slowly clap over near the food. Then another person joined, and another, until there were about 20 people, all G.O.s clapping in time. David said “Whatever is going on?” and I lied saying “I don’t know!” I had my suspicions! And then they started to make their way towards our table and the penny dropped for poor David who hates to be the centre of attention. The parade was led by Charlie, the dining room manager, and consisted of Georgie, Monica, Glenn and many other G.O.s some we had met and many new to us. They sang happy birthday with enthusiasm and David got a kiss from quite a few of the girls. Then they were gone, back to their own meals as swiftly as they’d arrived. 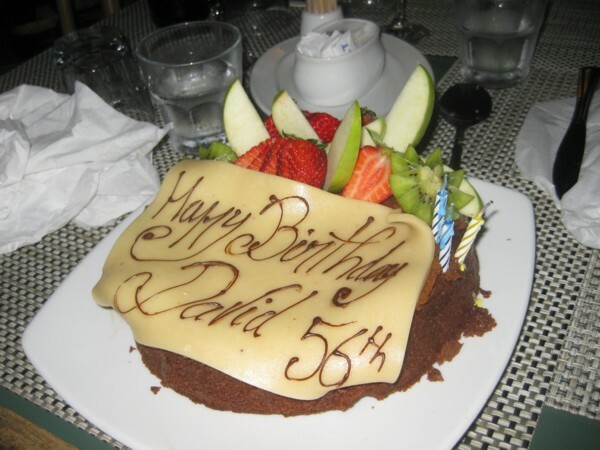 The cake was really prettily decorated with fruit and a marzipan-like ‘sheet’ that had ‘Happy Birthday David 56th’ piped on it. We loved the little ‘hey!’ noise that the G.O.s made between claps as they’d come towards us. The video probably isn’t worth sharing unfortunately; I stopped when I should have carried on filming so it’s very disjointed. Once peace reigned again I ran around the dining room to find Charlie, Glenn and Monica and asked them to come join us after they’d finished their meals to have some cake. It was certainly big enough to share! It was the first time we’d chatted with Charlie and he was gorgeous. Such a relaxed, peaceful man with a ready smile and very easy to talk to. So we did not have any of the fruit from that beautiful table as we were full of chocolate coconut cake – and very nice it was too! After dinner David went to the bar for a drink and I asked for something with milk and Kahlua. He came back with something called a cappuccino cocktail and it ticked all of my boxes. Lip smacking good! Considering I don’t usually drink milk, coffee or alcohol I really do branch out on holidays!!! The show tonight was a ‘Couples Show’ which was fun enough, but certainly not the standard of the night before. Four couples were chosen from the audience and given several tasks to do for which points were given. It provided a few laughs and passed some time anyway and afterwards we had another drink. In the bar they held an activity called a Couples Hat Dance. David was chosen by Monica to be her partner and the game was run by the lovely Jessica, the manager and choreographer of all the shows. She had the most beautifully expressive face that shone with joy every time we saw her. Couples always had to hold hands while they danced around. If a hat was put on one of their heads they had to put it on someone else as fast as possible because when Jess said ‘stop’, those wearing hats had to sit out. David and Monica lasted about 3 ‘stops’ before they were out. Somehow or another I think I heard that Queensland had had 6 times its previous record for the amount of rain during November. David thought he heard that it had had the 6th wettest November on record. One or neither of us was right. And so goodnight to another day in wet paradise. The”cotton reel thing” is a diabolo—-you really knew that didn’t you??? Good on you doing the hula hooping!! and David looks a real Robin Hood!! Ahh, bless you and thank you. I’d heard the word but would never have remembered it, and I doubt Google would have found it if I’d searched under ‘cotton reel thing’ LOL David certainly did look the part huh? Great archery stance that’s for sure!!! And yes, it was a great shame about the weather. We feel that we made the best of a bad thing but so much would have been different with some clear skies.